I agree with having a third printing all the way. Even if just a small run, I'm sure that fans would be willing to pay the premium if it means not waiting for the stupidly overpriced ebay options. I would definitely be willing to pay the premium. Lulu is not an option because it publishes as well as prints. FO:E is never to be published. Go over here or read below. I also mentioned that reusing the already formatted PDFs would save time (although I would prefer 5 books with 20.5 inserted into the text which would only require reformatting the second book of the original PDFs of the first printing ). Since the first 2 printings were at a time when I hadnt read FOE yet, I would also love a third printing. I do hope a third print will come our way at some point. What with the Fallout hype build-up, there'll be a lot more people interested in it, me included! I started reading the E-Version, but to own the physical copy would be so satisfying! I did start to compile a list of mistakes in those PDF's (Version 19) There were some 10 mistakes (some spelling, some grammar and some words that were entirely wrong, probably due to auto correct) I listed by like chapter 3. If there was a 3rd printing they would need to be corrected. (Also being from the UK, it drives me crazy when Z'd are used in things like 'materialized', only using 1 L and your loathing of the letter U, but there is no way all those will change as much as I would like "
Eventorizon wrote: I did start to compile a list of mistakes in those PDF's (Version 19) There were some 10 mistakes (some spelling, some grammar and some words that were entirely wrong, probably due to auto correct) I listed by like chapter 3. Wasn't one of Kkat's stipulations on it being printed, originally, that they couldn't edit it, and if it was going to be printed, it had to be printed with the mistakes? I seem to remember seeing that somewhere. No idea but its possible. Its Kkat's book and Kkat's choice, but it seems a shame to leave it with the mistakes in. Yes, that is correct. The story has to be printed as it is without any editing. 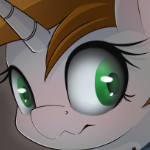 Having read Fallout: Equestria mid-late 2015 I was late to the party. I would love a third printing (or a project horizons printing, depending on when somber finishes the edits) in time for Christmas, even If I have to wait a year or two, I just hope you do another print.